Once upon a time there was a little girl named Perdita, who lived with her father, her mother, and her brother in a little cottage in a big city. Her father was only a humble tin-cutter, and her mother’s fingers were stained with rust from working in a ball-bearing factory, but Perdita was famous for miles around because of her extraordinary beauty. She was not a bad girl, but she was very vain, and spent hours every day preening in front of her mirror. One day, the Circus came to town. The father decided to take the whole family there, even though they didn’t have very much money. So off they went to see the Glass-Eater and the Broken Lady and the Electric Weasels for which this particular circus was known. After the Glass Eater had spat out his last bottle of the afternoon, but before the Weasels were due to arrive in their famous Luminous Barouche, Perdita saw a balloon salesman selling beautiful bouquets of balloons. The balloons came in extraordinary colors—firelight-on-steel was one, the green of a heaving sea another. Perdita was fondest of the red ones: cheerful balls of bright blood red with long strings that bounced and tugged up against your hand exactly like hope. As soon as Perdita saw them, she knew she had to have some. She begged and she wheedled until her family came over, but the balloons were very expensive. Finally her brother said he would use his allowance to buy her some, and the jolly salesman (whose face was as round and red as one of his balloons) said she could have a whole bouquet on account of she was so beautiful, and she could choose exactly whichever ones she wanted. So Perdita began choosing her most favorite red balloons. But she was so vain, and so particular, and so slow about it, that finally her father said the rest of the family was going to see more of the Circus. Perdita was to follow the balloon salesman on his rounds. When it was time to go, the family would look for the red balloons and come and get her. But by the time she finished making her choices, she realized that the salesman had traveled far, far away from the fairgrounds. Clutching her bouquet of balloons, Perdita ran and ran all the way back to the Circus, but when she got there the grounds were empty and the gates were shut. How silly I have been! she said to herself, blinking back her tears. I took so long picking out my balloons my family got tired of me and left! And now I don’t know where the balloon man is either! And thinking this, she sat down at the circus gate and cried a little cry. As the sun went down, she saw that the circus was not in the very nicest part of town, and she felt sure it would be a bad idea to spend the night there. She could just hear the crunch-crunch of the Glass Eater having dinner, and it gave her the shivers. Besides being very beautiful and rather vain, Perdita was a brave and resourceful girl. She decided she would find her own way home, even though she wasn’t quite sure how to get back to the humble tin-cutter’s cottage. But Perdita thought, what if my father or my mother or my brother comes to look for me? I know: I will leave a trail of red balloons so when they come back here, they can follow me. I will start walking, walking, walking for home, and every few blocks I will tie a red balloon to something I pass, so they can see where I have gone. She walked and she walked and she walked down the streets of the city, looking for the humble tin-cutter’s cottage, and stopping every now and then to tie a red balloon to a stop sign or a comm. kiosk or an abandoned shopping cart so that her family could find her. The night was dark, and the city that seemed so safe during the day seemed menacing and full of shadows. She tried to stay awake, she tried as hard as she could because Perdita knew that terrible things can happen to little girls in their sleep, even very beautiful ones. It was still night, but in the smoky amber light of the streetlamp overhead, Perdita could see that the little creature was telling the truth. It was a Clockwork Rat, with wires for whiskers and a rubber wiper-blade for a tail, and pointy ears made from open safety pins. Instead of claws it had tiny hooked scissors on the ends of its feet, the kind that doctors use to cut you up. The creature was so terrified its whole body shook and made little rattling noises, and its tin teeth, which looked like they had been made from the scraps under her father’s workbench, were chattering furiously. “Are you just saying that?’ Perdita asked suspiciously, giving the Rat a little shake so it rattled with a sound like a pile of forks dropping into a tin pot. 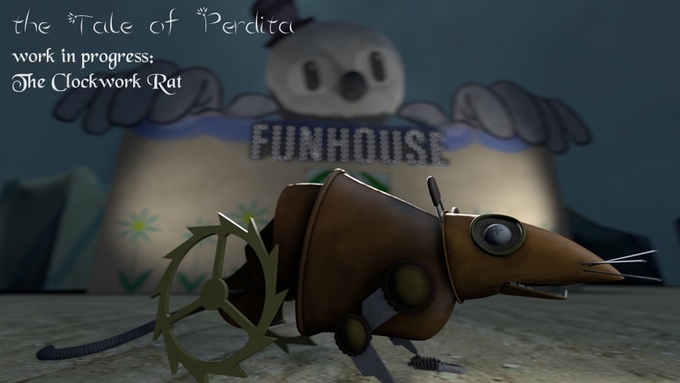 Together Perdita and the Clockwork Rat set out to travel the city together. The Rat promised he would show Perdita the way home, and at first the little girl’s heart jumped for joy. But although the Rat was true to its word about finding safe dark holes to hide in, and scraps to eat of things almost like food, somehow they never seemed to find the humble tin-cutter’s cottage. And the night never ended. And the day never broke. And the line of red balloons behind Perdita grew long and long. At last Perdita had to stop and sleep again, so the Clockwork Rat showed her a special hidden spot behind in a ball-bearing factory that looked strangely like the one her mother worked in, only this one had been abandoned for years and years. He covered her up in sawdust and bits of old packing tape, and Perdita fell asleep to the sound of her new friend clicking and clattering through the gloom with a sound like faraway pennies sliding across a concrete floor. It was still dark when she woke up, and she felt a throbbing pain in her hand. When she looked down, she found one of her thumbs was missing. In its place was the head of a pair of needle-nose pliers. She looked around for the Clockwork Rat. He was perched on the edge of a rusting barrel full of rain water, furiously washing something off his little scissor claws. “Hey!” Perdita shouted, so loudly that the Clockwork Rat squeaked with alarm and tumbled into the water. Perdita ran over and stuck her hand into the barrel and fished around until she clamped the Rat’s rubber tail in the grips of her new metal thumb and pulled him out. “No!” Perdita cried. But she bit her lip, in the exquisitely fetching manner she did when perplexed, and was careful not to look at her reflection in the barrel of rain water. And as they walked through the city that day (or rather, night, for still the dawn would not come) she looked away from all the windows. The night stretched on much as the last one hand. They had now walked so far that if it hadn’t been for the trail of balloons, Perdita would have given up all hope of ever being found. When finally she fell asleep again, the sound of tin-snips followed her into her dreams. When she woke up, there was a small electric iron at the bottom of her right leg instead of a foot, and something felt strange about her hair. Perdita forced herself not to cry, because she was a brave girl, and full of pluck. “Today we will find my home,” she said. The next time Perdita woke up, she found an egg-beater where her left hand used to be, and when she bit her lip she found her teeth had gone all thin and flat and sharp as tin. With a cry, Perdita turned and ran for the nearest shop window. “Don’t!” the Rat cried, but it was too late. Standing in the wicked yellow light of the streetlamp, Perdita stared full at her own reflection, and wept at what she saw. There was a scrabble of claws behind her. “I told you not to do that,” the Clockwork Rat said, with a voice like shell casings rattling on a steel floor. Whirling around in dismay, Perdita saw that the Rat had climbed to the top of the phone boot where Perdita had tied her last red balloon. As the little girl watched, the Rat flexed its paws and put its little hooked scissor claws around the string. But the Rat laughed with a sound like scalpels bouncing on a metal tray, and cut the string, and the red balloon went drifting up, up, up into the night sky.